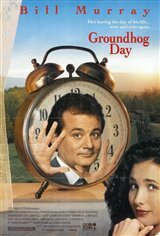 Arrogant Pittsburgh TV weatherman Phil Connors (Bill Murray) travels with his crewproducer Rita (Andie MacDowell) and cameraman Larry (Chris Elliott) to Punxsutawney, Pennsylvania, where his assignment is to cover the annual Groundhog Day festivities. Phil believes he's above covering such an event and hates small towns. Rita and Larry think he's pompous and can't stand him. But after grudgingly reporting on the event, instead of returning home as soon as possible, the crew is forced to stay overnight when a blizzards hits. When Phil wakes up the next morning, he finds it's February 2nd all over again and he's forced to live the same day over and over again until he gains some insight into his life.